We create handmade home decor that's perfect for beach cottages, lake cabins, nautical nurseries, beach bars, beach-themed rooms, any room where beach lovers are found. 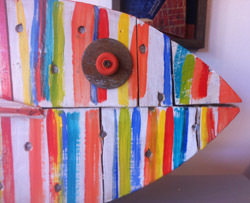 Our colorful coastal creations are made from new and recycled materials. We love creating eye-catching fabrications that surprise and make people smile. As well as our ready-made pieces, we love working with customers to fabricate pieces that fit with their style and color palette. Share our passion for art and design, drop in to our studio + store on Route 28 in Dennis Port, MA on beautiful Cape Cod or click below to go to our online Etsy store.